The Mercedes S Class Hire is truly in a luxury class of its own. 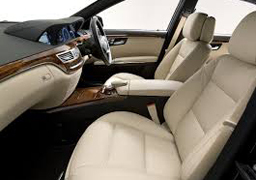 Mercedes Benz S Class describes the Mercedes Benz S Class as the most Executive car ever made. The Mercedes S Class Hire is the most stunning and impressive car and was the most popular wedding car hire in 2012 & 2013, and has won many awards for the wedding car of the year. The Mercedes Benz S Class imposing vehicle is perfect for all occasions. 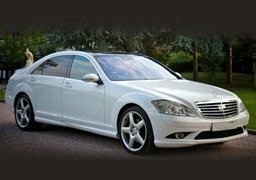 Whether it be for School Prom Hire, Birthday Hire, Stag Night Hire, Hen Night Hire, Airport transfer hire, Royal ascot hire or wedding car hire. The S Class is built from the largest material to a unbelievable standard, Mercedes have made an excellent car in the s class. The suspension ensures that smooth ride is guaranteed in this luxury car, and its also known for being quiet, so that you can enjoy the journey even more. Even more, our long wheel base model ensures plenty of leg room for those airport transfer, and not forgetting the heated and ventilated rear and front seats. So you can sit back and enjoy the ride. The pearl white custom paintwork reflects the sunlight beautifully, making the car seem even more vast and imposing. The Mercedes Benz S Class hire is everything you would expect of a Luxury car; comfort, style and effortless sophistication. You are assured of a classy and an amazing entrance to your prom, birthday, wedding or even at a drop to the airport. Whatever the occasion travel in style with our Mercedes Benz S Class. 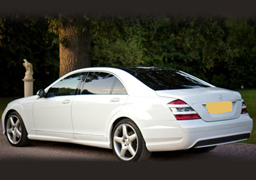 The Mercedes Benz S Class car hire will ensure your special occasion is truly memorable. Arguably the largest car on the planet, hiring a The Mercedes Benz S Class hire is the ultimate statement of class and style. The latest generation of Technology builds on the heritage and history of this amazing marque of quality and luxury. 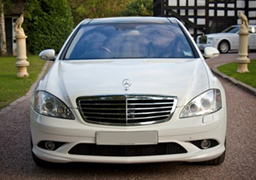 Popular events covered with the The Mercedes Benz S Class Hire include: Birthday The Mercedes Benz S Class Hire, School Prom The Mercedes Benz S Class Car Hire, Birthday The Mercedes Benz S Class Hire, Airport transfer The Mercedes Benz S Class hire, Royal ascot The Mercedes Benz S Class hire, wedding The Mercedes Benz S Class hire. Platinum Limo Hire also provide a wide range of other latest and new limousine hire vehicles and Wedding Car Hire which include Rolls Royce Phantom Hire, Rolls Royce Ghost Hire, Bentley Flying Spur Wedding car hire, 8 & 16 seater Hummer Limo Hire, Chrysler 300 Bentley limo, Ferrari limo hire, Lincoln Towncar Limo Hire, Rolls Royce wedding car hire.